What makes a whisky rich, sweet, fruity, oily, spicy, or smoky? 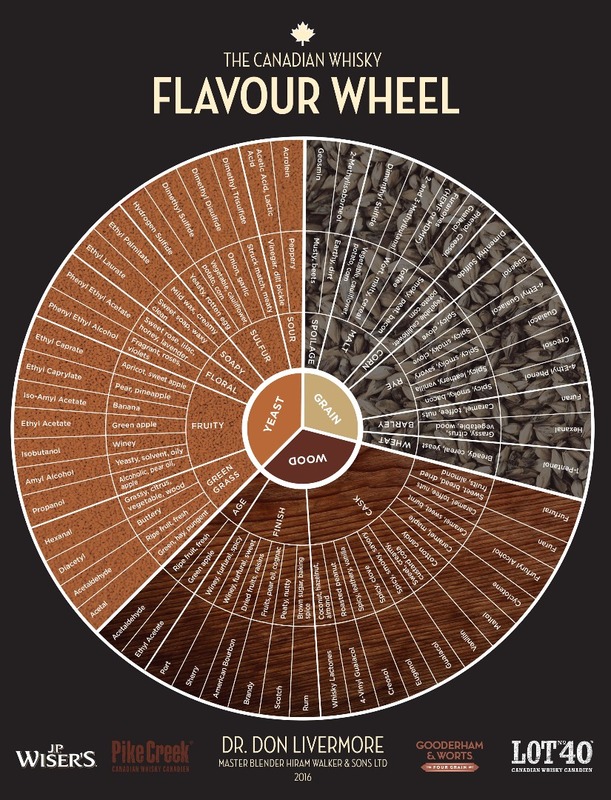 Whence does whisky derive its flavours and aromas? Some mistakenly assume that the region, or terroir, is solely responsible for the character of a whisky. Some believe every scotch is smoky, every bourbon is sweet, and every Canadian whisky is mild. Some slightly more knowledgeable people may point to the various grains as the source of whisky's flavours. The idea that provenance and grain type are the determining factors in whisky's character is passed on as received knowledge from the whisky sages. While there is some truth to this, it's far from a complete picture. Other factors that may influence the final product include cask types (Virgin oak, ex-bourbon barrels), yeast strains, intensity of barrel char, cask sizes (200 litre bourbon barrels, 125 litre "Quarter Casks"), still types (e.g. column still or pot still), finishing a whisky in different types of wine casks (or cognac casks!) and a myriad of other factors. 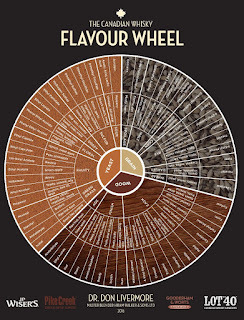 This can get pretty complex, so Hiram Walker's Master Blender Dr. Don Livermore developed a Canadian Whisky Flavour Wheel to help identify some of the common flavours we taste in whisky, how these flavours might come to be perceived in a whisky, along with the chemical compound responsible for the flavour. If the image is too small, you can find the original by clicking here. Why the mini-lesson on flavour? Read on. Highwood is not known for its over the top marketing. You might call them the "anti-Macallan". The Macallan has recently unveiled a new visitor centre and distillery worth upward of £140 million (approximately $243 million CAD) that looks like it belongs in Hobbiton. The Macallan has an interactive website featuring 72 year old whiskies in crystal decanters, whereas Highwood's website features all of its whiskies on one page, and it gives you exactly two sentences about their 20 Year Old Decades of Richness whisky. Alberta's Highwood Distillers may eschew big, shiny marketing, but the distillery is known and celebrated for its fantastic line of whiskies. Highwood Ninety Decades Of Richness 20 Year Old is an interesting case study. Despite being labeled as a Canadian Rye Whisky, this whisky is distilled from 100% Corn. So why call it a "rye whisky"? Well, it's complicated. 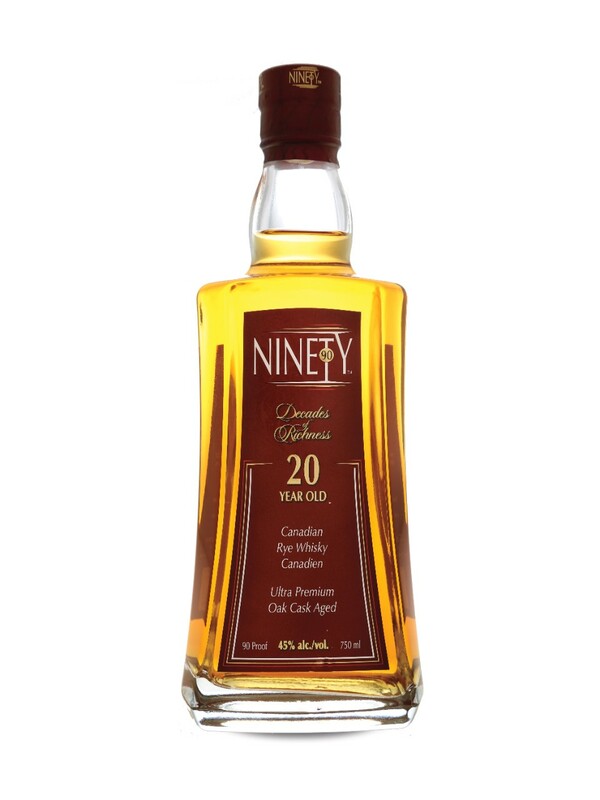 Canadian Rye Whisky refers to a style of whisky as much as it refers to the rye grain itself. Many of the notes typically associated with rye grain, specifically the spicy notes like cloves, can also be imparted into a whisky by barrel compounds. There is a long tradition in Canada of using the words "rye" and "whisky" interchangeably. In bars and backyard barbecues here in the Great White North, you'll often hear people ask for a rye and ginger or a rye and Coke, regardless of whether the spirit of choice was actually distilled from rye grain. People might be a tad puzzled if you ask for a Whisky and Coke. Canadian distillers are loath to change their nomenclature just because that's how someone else does it. So how does this twenty year old, 100% Corn whisky taste? Does bottling it at 90 proof (45% ABV) make it too hot to handle? Palate (undiluted): very rich arrival, full-bodied, brown sugar, oak spice, a bit of salted caramel, buttered corn, a bit reminiscent of a good amber rum near the end. Finish: a bit drying, but still medium-long, maple butter, more oak tannins and a slightly herbal note at the very end. With water, there is a big brown sugar note on the nose that quickly turns to barrel spices and tropical fruit. I’m thinking grilled pineapple. With water, the arrival on the palate is a tad spirity, but quickly becomes floral and pear notes appear. The finish is spicy, a bit tannic and pulling. I prefer this one without water, as the rich texture is thinned out a bit too much with water and the spirity arrival throws off the whisky's balance. It may be anathema to some, but I tried a whisky sour made with Ninety Decades of Richness and I have to say it was magnificent. The rich, sweet and slightly spicy whisky perfectly complemented the lemon juice and simple syrup. There isn't quite enough spice for this to make an Old Fashioned to my liking, but I heartily endorse this one neat or in a whisky sour. This is a terrific whisky. It's a terrific Canadian Rye Whisky, even if it's made entirely from corn. 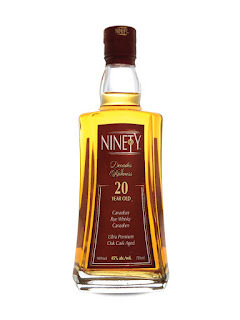 Ninety Decades of Richness 20 Year Old is one of the most affordable twenty year old whiskies you'll ever encounter. Recommended.